Lucia was inspired by Lucie Bernier, the president of Pure Living Products. Her many travels to Europe and Asia have led her to bring back an assortment of Renaissance designs on fabrics from Florence, ceramic work from Portugal, Spain and Italy. She wanted to create a line of specialty soaps and candles that reflected these rich textured designs. Each design reflects old world charm with a modern touch. 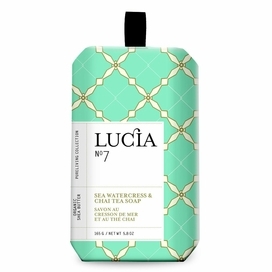 The Lucia logo in black & white reflects the 'cleanliness' of a soap product and at the same time counter-acts the rich and 'busy' textures of the old world designs. The box construction of the soaps was inspired from old, pre-war soap designs from Spain and Portugal and the candle box construction was inspired by the 'Pannetone' cake found in Italy.